Wednesday, September 24, 1913: Nothing much continues. Grandma, I know that you were writing the diary for yourself . . .and that nothing much happened, AGAIN. But for those of us glancing over your shoulder a hundred years later we care about even the little things like, what did you eat for dinner? It’s getting to be Fall, maybe you ate winter squash from the garden. . . . and if it was a small squash perhaps it was stuffed with meat, vegetables, and cheese. Here’s a recipe I often use to stuff acorn squash. It’s not an authentic hundred-year-old recipe—they definitely wouldn’t have had sliced American cheese back then—but I like it and it gives a sense of how people used miscellaneous fall vegetables and other common ingredients to stuff squash. Delicata or other small winter squash can be substituted for the acorn squash. 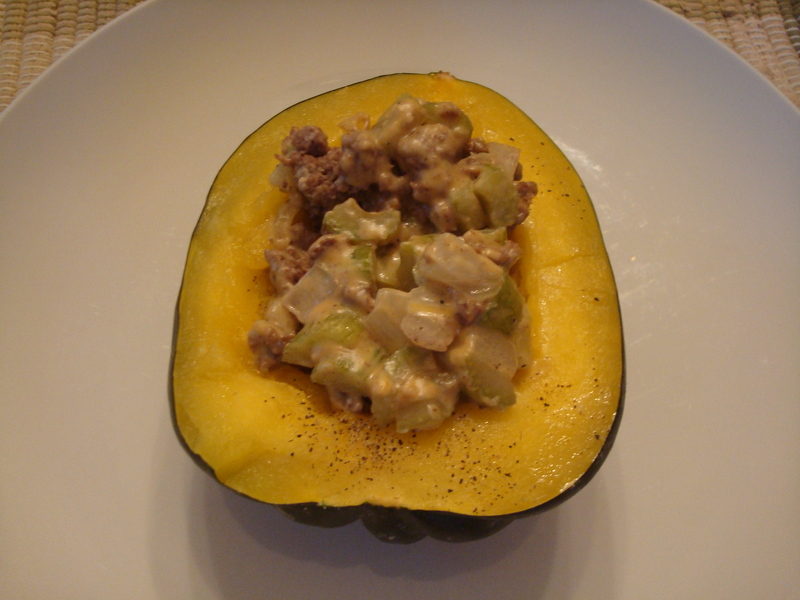 About 10-15 minutes before the squash has completed cooking, brown ground beef in skillet. Add celery and onion; cook until tender. Add cheeses and stir constantly just until cheese melts. Turn squash up on serving dish; dot with butter, sprinkle with salt and pepper, then fill cavity with meat mixture. *Or squash can be microwaved until tender—about 15 minutes. Posted on September 24, 2013 August 30, 2015 by SherylPosted in Food, recipesTagged squash. This is great, I just started baking acorn squash just a few months ago, now I can try this new recipe. I will fool myself into thinking it is a 100 year old recipe 🙂 Wonderful post (as always). Cheers to a good week. I have just taken my great-aunt’s 1907 diary out of the storage box. I thought it would be interesting to see if there were similarities between a 20 year old girl in New Zealand and Helena in the US. It’s a pity I only have the one year. That’s really exciting! I’m looking forward to hearing about the similarities and differences. Mostly similarities at the moment! It really never seems to have occurred to Helena that someone else might read her diary, does it? Unless wild things were going on and she just didn’t want to share them with out prying eyes . . .
It’s a shame young people do not keep a diary like they did in earlier years. There is so much history that can be saved in one small book! I make stuffed squash with the same recipe I use for stuffed bell peppers. The small yellow ones. Not sure of the name. This recipe sounds delicious though. Are they oblong with beige and green stripes? If so, they probably are delicata squash. My mother-in-law used to call them sweet potato squash. I think they may be crookneck? The small ones are best and try slicing in rounds and simmering them with sliced onions in some olive oil and a little butter. Not sure. I have always called them yellow squash! 🙂 Anyway, I know what they look like! Thanks for the recipe! I love squash and pumpkin, especially when fall arrives! Mmmm, now I’m getting hungry for squash. I love the changing seasons, and eating seasonally. Great recipe. Your recipe sounds wonderful Sheryl. I definitely plan to try it. So true! If Helen only knew how many of us WOULD be glancing over her shoulder, I wonder if she would have seen her own world through different eyes?